available vacancies. 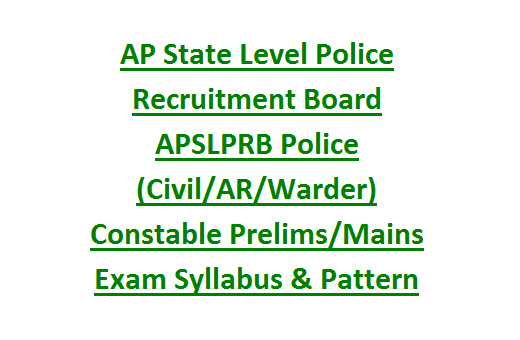 Selection for this recruitment of AP Police Constable will be held based on Preliminary Examination, Physical Test and Mains Examination. For prelims and mains examination syllabus will be same but difficulty level will be changed and standard of syllabus is intermediate level. Recruitment of AP Police Constable will be held based on three stages. This is mandatory to all candidates. Prelims test will be conducted for initial screening of candidates to select for the physical test and further tests. On the same day both tests will be conducted. Complete details are given below. Those who are qualified in Prelims Examination they are only eligible for the Physical tests. Those who are unable to clear the physical tests they immediately disqualified and not allowed for the further tests. The candidate who clears the successfully physical tests they are only eligible for the mains examination. Complete details of physical standards and physical test details are given below. Written Examination Date: 06-01-2019 (10:00 AM to 01:00 PM ). Prelims Examination will be conducted for 200 marks with 3 hours duration. Objective type multiple choice written test will be conducted. For Mains Examination also written test will be conducted APSLPRB Police Constable recruitment for 200 marks. For AR Constable Main Written test will be conducted for 100 marks only and for another 100 marks given to physical tests. Topics to be covered in exam syllabus is Intermediate standard. 5. Indian culture, History of India, Indian National Movement. 6. Polity and Economy, Indian Geography. Question paper will be in Telugu/Urdu/English. For Civil and Warder posts the candidates must have qualified 1600 meters running and 100 meters or Long Jump. For AR/APSP Constable all the events to be cleared. Merit in Physical Test and Mains test will be considered for final selection after clearing the medical tests. 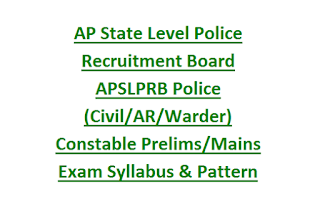 Click here to apply online for APSLPRB Recruitment of Constable..